A clinical study recently published in the credible Journal of Maternal-Fetal & Neonatal Medicine demonstrated that use of maternal nutritional supplements and a breastfeeding support program improve birth outcomes and exclusive breastfeeding rate in Vietnamese mothers. In recent years, Vietnamese nutritional status has been improved and Vietnam is recognized internationally as one of the outstanding countries in achieving Millennium Development Goals relating to maternal and child health, especially in the continuous and sustainable decreasing rate of acute and chronic malnutrition among children under 5 years old. However, Vietnam is still facing a double burden of nutrition. The prevalence of suboptimal maternal nutritional status remains high, due to low-nutrient density of the diets coupled with raised nutrient requirements during pregnancy and breastfeeding. According to a report of the National Institute of Nutrition in 2015, rate of zinc deficiency in pregnant women was 80.3% and that of anaemia was 32.8%. On the other hand, following a research by National Nutrition Institute (NIN) in 2015, among children below 5 years old the rate of underweight is 14.1%; stunting is 24.5%. Meanwhile, previous research has highlighted the importance of appropriate nutrition during the “first 1,000 days window” for both short-term and long-term health benefits of the offspring. Maternal nutrition during pre- and postnatal periods represents a continuum of nutrition provision for the breastfed offspring during this critical 1000-day window. Good maternal nutrition prepares the mother to meet the high-nutritional demands of breastfeeding. According to Unicef, nutrition interventions are among the best investments in development that countries can undertake . This is the study on Vietnamese mothers demonstrated the effects of MNS during pre-natal period and continued through to post-natal period on exclusive breastfeeding rate, birth outcomes, and infant growth. The study was conducted by the research team of the National Institute of Nutrition and Abbott from October 2013 to April 2015 and was approved by National Institute of Nutrition and Ministry of Health. Moreover, the study has been recently published on The Journal of Maternal-Fetal & Neonatal Medicine - the official journal of The European Association of Perinatal Medicine and other science communities. This is the first study from Vietnam about maternal health nutrition to be published on this credible channel. Maternal milk supplement used in the study was Similac Mom, a science-based formulation uniquely designed to help mothers meet the increased nutritional needs during pregnancy and breastfeeding. Outcomes of the study have been recently utilized as scientific references in the “National Guideline on Nutrition for Pregnant Women and Lactating Mothers” issued by Vietnam Ministry of Health in March 2017. 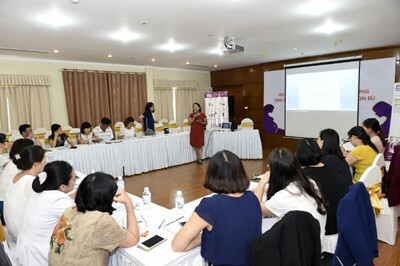 The Guideline, that aims to enhance health of women of reproductive age and stature of Vietnamese people, is a part of the project “Improvement of nutrition status for pregnant women and lactating mothers” under the strategic partnership between Ministry of Health and Abbott with the long-term goal to enhance health of Vietnamese mothers and babies.